Greatly anticipated this movie, as I grew up w/ Mom & her family singing Hank’s great standards…. It was wonderful! Poignant, stirring…. made me laugh & made me tear up a bit. Thoroughly enjoyed recognizing a lot of the locations also, living near Benton & Little Rock. Henry Thomas as “Luke” was definitely a hit…. I actually had to remind myself that he wasn’t that sick or fragile – telling everyone to catch it. Thanks for this treasure! 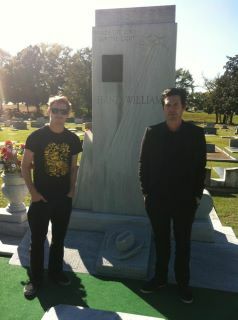 Before the opening in Montgomery, the two stars Henry Thomas and Jesse James posed at the Hank Williams’ grave and memorial. I don’t think a final decision has been made on the future of the film. Something will happen in January; either more theatre showings, or TV, or out on DVD. Here’s the link to the Facebook page.